The goat gap - why aren't farmers raising as many goats as we eat? The demand is there. So why aren’t American farmers raising as many goats as we eat? What, indeed? Goat is the healthiest of red meats. Since goats live on pasture, their meat has low saturated fat content; at the same time, the omega 3’s and other fatty acids that they ingest actually lower cholesterol. In addition to health benefits, goats thrive on land unsuitable for other species and are particularly suited to maintaining vacant and unused farmland where they feast on bush honeysuckle, groundcover weeds and tough vines. So where is the booming U.S. goat industry that Dan Barber’s description might lead you to expect? For the most part, it’s not what it could be. At least not yet. There’s a proven unmet demand (we import about half of our goat meat), but the infrastructure doesn’t quite exist to get American goats to market. And the reasons why offer a fascinating view into how food markets work—and sometimes don’t. So what happens to their brothers—the 40,000 to 50,000 male dairy goats born each year who don’t produce milk? They’re a hard sell for farmers, says Lynn Fleming, founder of upstate New York’s Lynnhaven Farm. She has no problem selling her goat cheeses at farmers’ markets and high-end restaurants in New York City like Danny Meyer’s Eleven Madison Park and Jean-Georges Vongerichten’s ABC Kitchen. But unlike in the cattle industry where male dairy calves can be used for veal or ground meat, there is no obvious channel for goat meat. Producers must decide whether or not to raise them for meat, an expensive proposition for a business with, at best, a small profit margin. If they can’t be used for meat, they’re sometimes wethered and used as show animals. That tiny margin, by the way, is not because goat fetches a low retail price–quite the opposite. It’s because goat meat is so expensive and difficult to produce. In other words, demand isn’t the problem. “Goat will never be a cheap product,” says Anita Dahnke, executive director of the American Goat Federation. “You cannot feedlot goats like you can cattle.” That’s because they’re extremely susceptible to parasites, which are ingested from the soil and passed out through their manure. Overcrowding makes the problem exponentially worse. Even managing the wormload of healthy animals takes a lot of skill and patience, says Suzanne Gasparotto, owner and educator at Onion Creek Ranch in Lohn, Texas. Because of the industry’s low profile, there are few if any commercial medicines available when goats get sick. In order to keep illness-prone herds healthy, you need a lot of land—the most experienced farmer might have trouble supporting more than a few animals per acre. And fewer animals per acre means fewer dollars. At the same time, Dahnke says, few slaughter facilities are willing to process and package goats. All in all, it adds up to a stark financial picture—the USDA estimates that 91% of goat producers make less than a fourth of their income from farming. The United States is 750,000 head deficient in meeting current demand for goat meat. Considering average herd size, that’s about 25,000 herds too few. These are interesting times in the goat world, as researchers and advocates look for ways to raise the animal’s profile in the marketplace. To call attention to the plight of male dairy goats, the online butcher Heritage Foods launched a “No Goat Left Behind” campaign with an annual Goatober, linking restaurants and butchers with dairy goat producers. Participating restaurants featured special goat meat dishes such as braised goat ragu, goat filled ravioli, goat buns, and goat curry. Until recently, most goats consumed domestically were dairy goats. But as the demand for goat meat grows, farmers are raising goats specifically for their meat, breeding for a heavier muscle mass than typical dairy breeds. The most popular are Spanish meat goats, which are not purebred but a cross between native Texas or Spanish goats and Nubians, dairy goats that are also good meat goats. These so-called native goats were originally brought into the southern United States by Spanish invaders, hence their name. In 1993, the Boer goat, a South African breed was introduced into the United States. It matures faster than dairy goats and therefore is more economical to produce and has haunches that contain almost twice as much meat as those of the Spanish goat. 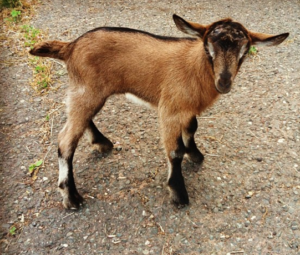 Will new breeds help close the goat gap? Maybe. But one thing’s certain: if producers can solve the supply-side challenges, the demand is there. Though it’s still a fractured market. Besides, unlike other livestock producers, goat farmers don’t have to worry about competition from industrial agriculture. “With the average herd size only thirty head, goats lend themselves very well to small-scale farm operations,” Dahnke says. Big Goat? Not likely. Jan Greenberg is the author of Hudson Valley Harvest: A Food Lovers Guide to Farms, Restaurant and Open-Air Markets. Publications include Virtuoso Life, Food Arts, National Culinary Review, Edible Manhattan, Gastronomica, and Departures.com. Among her awards is the Association of Food Journalists “Best Food Feature in a Magazine."